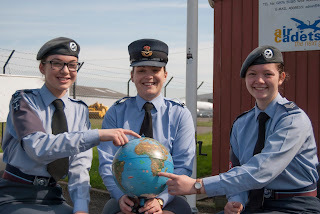 84 (Coventry Airport) Squadron Air Training Corps: 84 Girls on Tour! Corporal Roddis & Sergeant Jenner start their route planning! Two cadets from 84 Squadron have won places on a chance of a lifetime trip to South Africa taking place in 2017 joining fellow cadets from the Wing to complete an intensive community project and to explore some of the dramatic landscape in the region. The 20 day trip entitled “Operation Drakensberg Elephant” is being organised by Warwickshire and Birmingham Wing, and will take place in August next year. The 30 lucky cadets taking part will volunteering to refurbish one of the classrooms at a primary school, trekking through the Drakensberg mountains and climbing Giants Castle which stands at 3,315m as well as learning about South African environmental issues, culture and heritage. Cadet Sergeant Phoebe Jenner and Cadet Corporal Georgia Roddis were both over the moon when the news was broken to them and even more excited to learn that they were going together. "It will be so different from anything I've done before, I just can't wait" said Sgt Jenner. Cpl Roddis added "I'm really looking forward to learning about the environment there and seeing the animals on safari". Both cadets have got a challenging fund-raising task ahead of them. As well as raising an individual target of £750 each, they will be aiming to raise more money to pay for new equipment for the volunteering work. They are hoping to get their first funds at this Sunday's reunion, as Cpl Roddis will be selling cakes and crafts, and Sgt Jenner will be selling plants, and would welcome any support you can give!